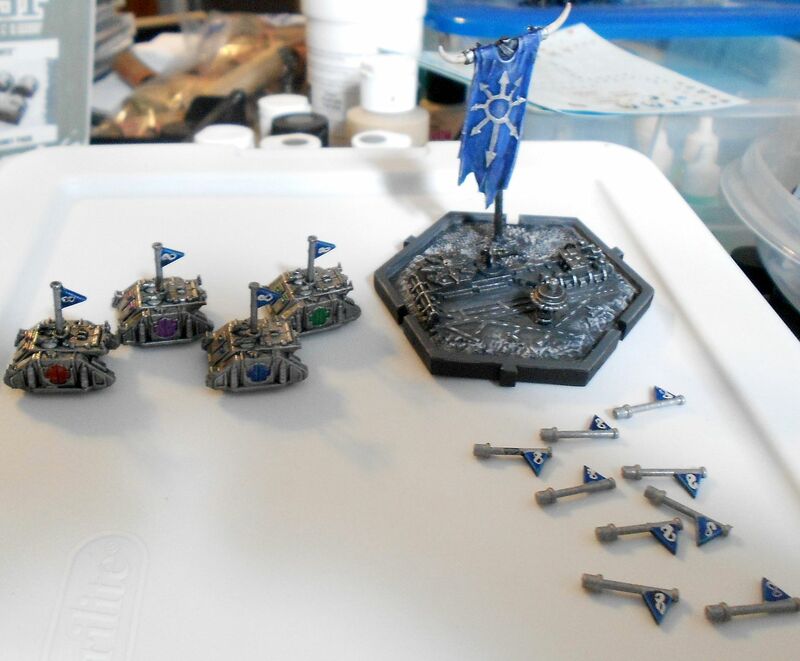 For the new 40K campaign I've recently joined, the organizer gave us tiles for our command center for us to paint up. The bulk of the campaign board is shades of grey, so I wanted to largely stay with that, with some metal thrown in and some white stripes for the runways. I also added a few bits; the chaos star replacing one of the imperial eagles, an orbital defense laser (old metal epic lascannon platform) and some other metal epic bit I don't recall (maybe an early drop pod or Titan fire control tower? ), but I think it works well as a traffic control tower. Not content with a standard teeny flag for my HQ, I also brought in a fantasy chaos banner to help spot home base on the big situation board. 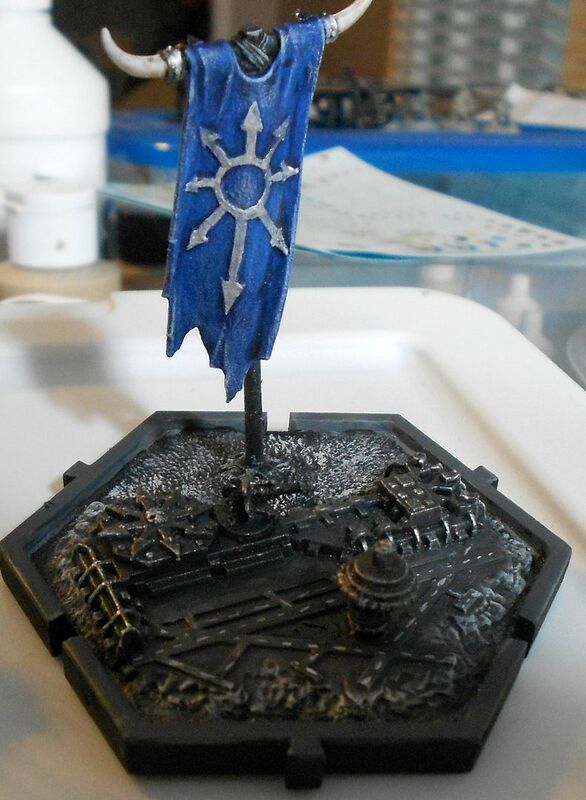 We also got an initial handful of flags to paint up as control markers. As we have a ton of players, I didn't want a simple single color that could get easily confused, so added the Endless Ones' infinity symbol to the banners. We're also going to have armies that move around and end up in particular spaces, so I also wanted something to represent them instead of just scraps of paper or something. While getting the other epic bits, I pulled out some epic rhinos to use for that. Some drilling and gluing later and banners declaring their allegiance were in place. I used some different door colors to tell the groups apart and which leader is with which army. I look forward to seeing what other folks do with theirs! Very neat Jim. Looking forward to hearing about your progress in this campaign. 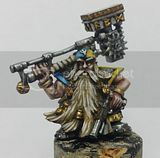 Another campaign: Avast ye Mon-Keigh!